Ospreys will be without Wales flanker Justin Tipuric when Scarlets visit them in the Pro12 on Saturday. Tipuric was injured in Wales' Six Nations win over Italy and is having concussion tests while lock Alun Wyn Jones' heel injury keeps him out. 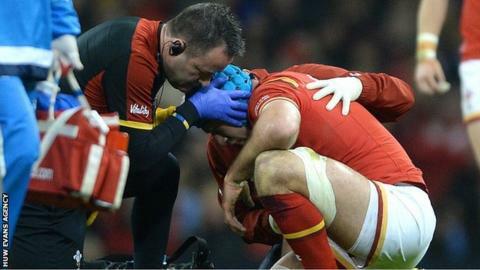 "It was such a heavy knock he (Tipuric) spent the first night in hospital," said Ospreys head coach Steve Tandy. "With these head injuries you've got to put the player at the centre of any decision regarding selection." Gloucester's Ross Moriarty scored two tries as Tipuric's replacement in Wales' rout of the Azzurri. Tipuric had himself been given a start for Wales in the injury absence of Cardiff Blues' Wales captain Sam Warburton, who had been concussed in Wales' defeat by England at Twickenham the previous weekend. Wales regular Jones was absent as Racing 92's Luke Charteris wore the his number five jersey alongside Wasps' Bradley Davies in the second-row. "It was such a heavy knock he spent the first night in hospital.